Well by now you may know why Larry Grace has placed a legitimate claim to the Dentist Award for 2012. It has been hard to keep a good toothy secret. But his long awaited 271-8 (MALCOLM BROOKER SR. x FANTASTIC FRINGE) is being released. From this point on 271-8 is to be known as “DR. STUMP”, after the Grace’s personal dentist. Larry feels like DR.STUMP ranks at the top of his most important introductions. The daylily has a stately garden presence and also is a hybridizers dream. The scape stands at 34″ and is a solid rebloomer. DR. STUMP sets pod and is pollen fertile. Larry has used DR.STUMP to clean up brown and mauve tones in his hybridizing. While we don’t know much about the parentage of FANTASTIC FRINGE, we do know F.F. throws beautiful scapes. DR.STUMP has a beautiful scape. MALCOLM BROOKER SR. is a cross of (FORESTLAKE RAGAMUFFIN x HL16). HL16 is a cross of (Larry Grace x Tetra Helena Louisa). MALCOLM BROOKER SR. lends itself fine clean color and a nice saw tooth edge on both the petals and sepals. Larry has offered to show a few of the seedlings he has bloomed from DR. STUMP at the bottom of his introduction. These seedlings are NICE! 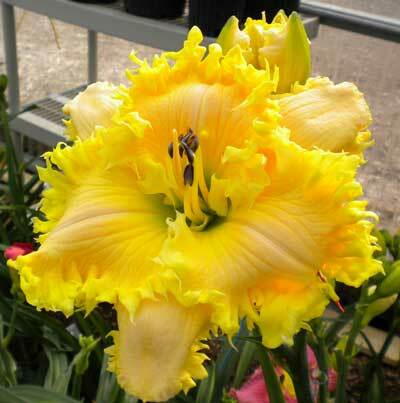 This entry was posted in Daylily Hybridizing, Introductions and tagged blog, daylily blog, Dentist, DR. STUMP, Larry Grace, MALCOLM DAVID BROOKER SENIOR, teeth. Bookmark the permalink.